John Burrell Garner, et al. v. State of Louisiana, Mary Briscoe, et al. The convictions were so totally devoid of evidentiary support as to violate the Due Process Clause of the Fourteenth Amendment. John M. Harlan II · William J. Brennan, Jr.
Garner v. Louisiana, 368 U.S. 157 (1961), was a pivotal civil rights case argued by Thurgood Marshall before the Supreme Court. On December 11, 1961, the court unanimously ruled that Louisiana could not convict peaceful sit-in protesters who refused to leave dining establishments under the state's "disturbing the peace" laws. African-American students from Southern University sat at a "whites only" segregated lunch bar at Sitman's Drugstore in Baton Rouge, Louisiana. The management summoned the Police after the students quietly remained despite being asked to relocate to another counter. After ordering the black patrons to leave, the Police arrested them and charged them with disturbing the peace, claiming that their behavior could "foreseeably disturb or alarm the public," according to the state's "disturbing the peace" statute. The National Association for the Advancement of Colored People defended the student demonstrators as did the Kennedy administration's Justice Department, which filed a legal brief on their behalf. Garner v. Louisiana was an important case for the Civil Rights Movement, and one of many civil rights cases argued before the Warren Court (1953–69). Eventually, the Civil Rights Act of 1964 "outlawed discrimination based on race, color, religion or national origin in hotels, motels, restaurants, theaters, and all other public accommodations engaged in interstate commerce." ↑ "Garner v. Louisiana, 368 U.S. 157 (1961)". FindLaw. Retrieved 2012-02-27. 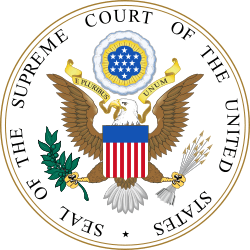 ↑ "1961 Supreme Court of the United States [Garner v. Louisiana] :: Southern University and A&M College" (PDF/HTML). Contentdm.auctr.edu. 1961-07-17. his.1961.fou113.pdf. Retrieved 2012-07-17. ↑ Geer, J. G., W. J. Schiller, et al. (2011). Gateways to Democracy: An Introduction to American Government, Wadsworth Pub Co.
↑ "First Amendment Timeline" (PDF). Annenbergclassroom.org. Retrieved 2013-11-03. ↑ Garner v. Louisiana. 368 U.S. 157. Supreme Court of the United States. 1961.